Though a scenic ferry trip across the harbour is reason enough to visit this downtown Dartmouth café, it’s the colossal croissants that have attracted a cult following. Rub elbows with locals at the communal table, and sip espresso made with direct-trade beans roasted at neighbouring Anchored Coffee. Offering 12 taps of local and Canadian craft beer (along with a few imports), Stillwell is the city’s premier beer bar. Pair your lager with an order of Tokyo Fries or the Okonomiyaki Fries, served with Kewpie mayo, sriracha, nori and katsuobushi. In the warmer months, Stillwell’s second location, the Beergarden on Spring Garden Road, is the ultimate spot to enjoy a local pilsner at the communal alfresco tables. This popular brunch spot serves up creative dishes, from bacon cheeseburger eggs Benny to the signature Elvis: slices of Montreal bacon, banana and peanut butter sandwiched between two buttermilk waffles. Expect to wait for one of the 20-odd seats. It’ll be more than worth it. Halifax’s only Spanish-inspired restaurant features an extensive menu of traditional tapas and pintxos with a focus on local seafood. The cocktail list, including the Fernet Buck – a mix of Fernet-Branca, Benedictine, rye, ginger, pineapple and lemon – plus an appreciation for amaro put this bar at the forefront of the city’s cocktail culture. Arrive early; the no-reservations policy most certainly means a wait. Chef Maurizio serves up North American food with an Italian twist at this Bishop’s Landing eatery. Dishes like Italian seafood stew with lobster and short ribs braised in Barolo pair perfectly with any number of bottles on the lengthy wine list. This waterfront destination has an outdoor champagne bar in the summer, which transforms into a Fire and Ice bar, complete with fur blankets and warm libations, in the winter. Diners wash down plump Tatamagouche oysters with flutes of Benjamin Bridge Sparkling in Edna’s salvaged-wood dining room. Jenna Mooers’ bistro menu draws from Nova Scotia’s land (tender beets and salad greens from the Annapolis Valley) and sea (seared local albacore in a dashi). Her mother and long-time restaurateur, Jane Wright, contributes desserts like salt-flaked vegan chocolate mousse. Weekend brunch consistently draws a crowd. Owner Frederic Tandy and chef Joe MacLellan offer guests an ever-changing eight-course tasting menu, where scallops become crackers and pigeon is smoked in hay-infused butter. In-house charcuterie, foraged ingredients and homemade butter put the focus on quality. This 20-seat restaurant fills up quickly, so be sure to make a reservation. Take a walk through history at one of North America’s oldest breweries, which has operated out of the same building since 1820. Live music plays in the background as tour guides explain the brewing process behind popular pints like the India Pale Ale and Red Amber Ale. Located on the waterfront, the museum’s permanent exhibits are dedicated to preserving Halifax’s maritime heritage. Immerse yourself in the history of boat building or learn how the 1917 Halifax explosion changed the face of the city. Titanic: The Unsinkable Ship, a captivating exhibit showcasing items found washed up onshore, details Halifax’s role in the tragedy and offers a glimpse into life aboard the iconic vessel. Recently rebuilt in a large, industrial glass and steel-lined space on the Halifax Waterfront, the three-level Discovery Centre takes family fun to new heights. Stargaze in the Dome Theatre, build a circuit in the Innovation Lab or let toddlers run free as they explore interactive exhibits on everything from farming to acting. An expansive green space in the middle of the city, the Halifax Commons has it all: a swimming pool, playground and skate park as well as tennis courts, baseball diamonds, soccer fields and water fountains. Emera Oval, the largest artificial outdoor skating rink east of Quebec, has free skate rentals in the winter and doubles as a track in the warmer months. Located one hour from the city, Old Town Lunenburg is a UNESCO World Heritage Site. Colourful historic buildings line the narrow streets, where artist studios abound (don’t miss the souvenirs at Dots & Loops) and local seafood shines (try the Digby clams at the South Shore Fish Shack). Minutes before the exit to Lunenburg, take a detour to Mahone Bay for sweeping views of the bay and its many islands. Housed in a bright building of floor-to-ceiling windows on Halifax’s waterfront, the farmers’ market is a bustling hub of farmers, butchers, bakers and artisans. Taste the award-winning aged Gouda from That Dutchman’s Cheese Farm and vintage wine from one of Nova Scotia’s vineyards. Lunch from one of the many food stalls – the steamed buns at Chenpapa come highly recommended – is best enjoyed on the rooftop patio. The market is open daily year-round (except on Mondays), but many vendors are only there on Saturdays. You can’t miss the red and white awnings and pale blue exterior of this boutique department store set against the row of nightclubs on Argyle Street. The shop is both quirky and trendy, offering everything from unique gifts – think retro lunchboxes and locally made soap – to popular clothing brands, such as Levi’s and Free People. Score a unique piece from local designers, including the store’s own clothing line, Bonanza by Biscuit General Store. Located in the heart of Halifax’s main entertainment district, this hotel offers personalized service and contemporary rooms done up in warm terracotta hues. After a meal of bacon-wrapped elk tenderloin, Gorgonzola gnocchi and pomegranate gastrique at Gio, grab a drink at Level Bar; then head for a night on the town on nearby Argyle Street. A former Canadian Pacific Railway hotel, this 1920s landmark preserves much of its historic charm, thanks to the lobby’s original chandeliers, rich wooden pillars and carved wood ceiling. The renovated guest rooms are small but well appointed and come complete with free Wi-Fi and Aveda bath products. Work and pleasure meet in this downtown hotel, which features a modern business centre, fireside lounge and lobby theatre. To unwind, soak in the harbour views from the rooftop terrace, enjoy a jade stone massage at Spirit Spa or splurge on dry-aged steak at Cut Steakhouse. A former Canadian National Railways hotel, this historic waterfront property blends original details with modern updates. Start with dinner at Elements on Hollis, where local favourites like seafood chowder complement more globally influenced dishes, such as chicken tandoori or hot and sour soup. Catch local comedians at nearby Yuk Yuk’s comedy club before retiring to your guest room with views of the Halifax harbour. Occupying a trio of heritage townhouses on Morris Street, this boutique property offers the comforts of a hotel with the intimacy of a B & B. Stories’ seasonal menu is one of the city’s best-kept secrets, featuring such delicacies as bison tenderloin carpaccio with truffled pecorino and blackberry brown butter tarts with house-churned cassis ice cream. A drink in the private garden courtyard is a must. This eco-friendly hotel specializes in affordable luxury. Wind down with a drink in the funky lobby, where 24-hour access to locally made packaged food – think bacon grilled cheese – is a novelty. Ultracomfortable beds and goose-down duvets make for well-rested early-morning departures from adjacent Halifax Stanfield International Airport. Sleek design, modern furnishings and warm East Coast hospitality make this downtown property a favourite among visitors. No detail in the spacious suites was overlooked, from the wet bar to the luxurious rain shower heads. Warm cookies upon arrival sweeten the deal. The Halifax Transit MetroX route #320 departs from the airport to downtown Halifax every 60 minutes and every 30 minutes during peak morning and afternoon hours. The fare is $3.50, and the trip takes about an hour. Maritime Bus offers a shuttle service with stops in the downtown core. A one-way ticket costs $22 and must be pre-purchased. A taxi or limousine service will get you downtown in about 35 minutes for a flat rate of roughly $63. Taxis can be hailed in the core, but calling is the most reliable option. From May to October, I Heart Bikes rents standard, tandem and electric bikes out of a shipping container on the Halifax Waterfront. Rates start at $12 per hour. Guided tours are also available. Discover the #9 spot on Air Canada's list of Canada’s Best New Restaurants 2016. When the gentleman bandit of Alfred Noyes’ 1906 poem The Highwayman came upon an old country inn, it’s doubtful he ordered the cured fish board. On Barrington Street in Halifax, it’s the right move. 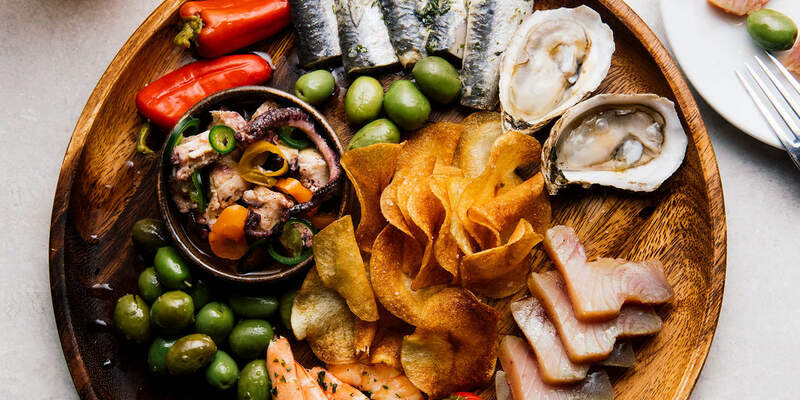 This sophisticated and hospitable Galician-style restaurant and bar celebrates its own seaside ties with luscious slices of locally caught, salt-cured albacore loin and silver-skinned sardine filets acidulated with good sherry vinegar. Chase them down with pickled sweet-hot peppers, and you’ll be swearing like a sailor. Ceilidh Sutherland and chef Dan Vorstermans own North End cocktail bar Field Guide; partners Adam MacLeod and Michael Hopper previously tended bar at La Frasca. These people know how to drink. A fish-friendly rosé, advertised in marquee letters on a cinema light box, is an aromatic, acid-tongued pinot blend from new Nova Scotia producer Lightfoot & Wolfville. The Jesus Bravo is a master stroke: blanco tequila, amaretto, lime and orgeat mixed with Anchor Coffee cold brew that lingers on the palate. The patatas extremas – patatas bravas amplified with hot peppers and intense, salty bullets of cured smelt – compel my dining companion from Boston (the Halifax of America, according to every soul we’ve encountered today) to utter some unpublishable nuggets of Bostonian street vernacular. I think that means he likes them? As we dig into squid-ink rice, crowned with prawns, clams and mussels and dotted with garlicky aioli, the antique light fixtures dim. Our fellow travellers are buzzing louder. Against Highwayman’s walls, trimmed with wainscotting and painted a deep sea blue, candles flicker in the night. We’re not ready to hit the road just yet.